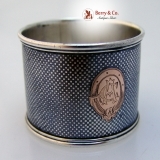 Sterling silver Niello napkin ring in a minoiature checkerboard pattern having an inlaid gold oval, engraved cartouche containing a period monogram AC. This elegant and unusual napkin ring is 1 7/8" in diameter, 1 3/8" tall, weighing 42 grams or 1.4 ozs. Troy. Monogrammed as described above, the soft, warm, original finish is present, with no buffing or machine polishing. The excellent original condition and clear detail, with no removals, repairs or alterations, make this an especially attractive offering.